How can I create different types of clients to access from the main window instead of having all clients listed there? You can create your own custom field, say "Status". 1. In the Backstasge View, go to the Advanced Settings => Fields option. Create a new custom field. 2. Click the Confirm changes button to apply the changes. 3. Then go to the Custom Fields tab of the Main Client window and specify the Status for each client. 4. Once you've set the Status to each client in the database, you can use the Customize Columns function in the table to display the Status. To do this, click the asterisk in the top-left corner of the table and select the Status check box. This will allow you to sort or filter the clients according to their status. 5. You can also filter your clients by using the Local custom filter. Alternatively, you can use the "flag" field of the Client list. 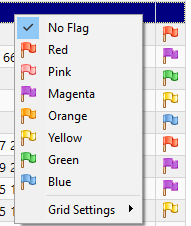 Decide which flag color corresponds to which status, then right-click on each client you want to mark and select the flag.